Salad is one of the favorite dishes in our house, and everybody loves it. I am always in the look out for new salad recipes. Acili Ezme/Turkish Chili Salad recipe is one that I got from a book Turkish delights by John Gregory-Smith. 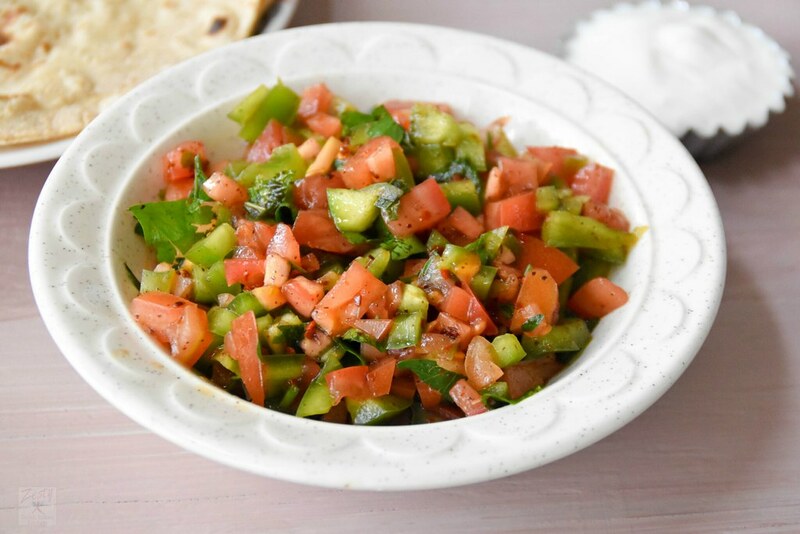 I came to know that Acili Ezme/Turkish Chili Salad is served as a sauce on kebabs or as a salsa with some pita. I have earlier tried Turkish spoon salad which we all loved. This one is like it but packed with fresh herbs, touch of spices and juicy texture. I served with chapathi (Indian flat bread) and curry as I don’t have any Pita bread in hand. I think if you are good at chopping by hand then this salad is one for you. I am not that good at chopping, but still I tried my best to do it. I read that you can’t use any choppers as it will not give the authentic taste. I followed the recipe from the book, but didn’t add any garlic or onion. I read that you can add that if you want. This salad is very simple with tomatoes, green bell peppers, spices like sumac, pepper flakes, juice of lemon and pomegranate molasses. I got hooked to middle eastern spices because of a grocery store near my old house called Phoenicia. And I love to buy and gather lots of spices from there being a spice lover, spices are my weakness. My hubby says you have so many collections of spices you need to take inventory in between otherwise you will forget, even though he is joking. I think I need to do that. Since it is winter, and I lost all my mint, I was forced to buy paying 2 dollars for few sprigs. I learned one more lesson, I should be thankful to mint, when it is growing. This is a simple salad, but make sure to add pomegranate molasses, sumac they bring out the flavor give it a try and let me know how it turned out. Next in my list is Turkish shepherd salad and colorful one. Acili Ezme/Turkish Chili Salad. 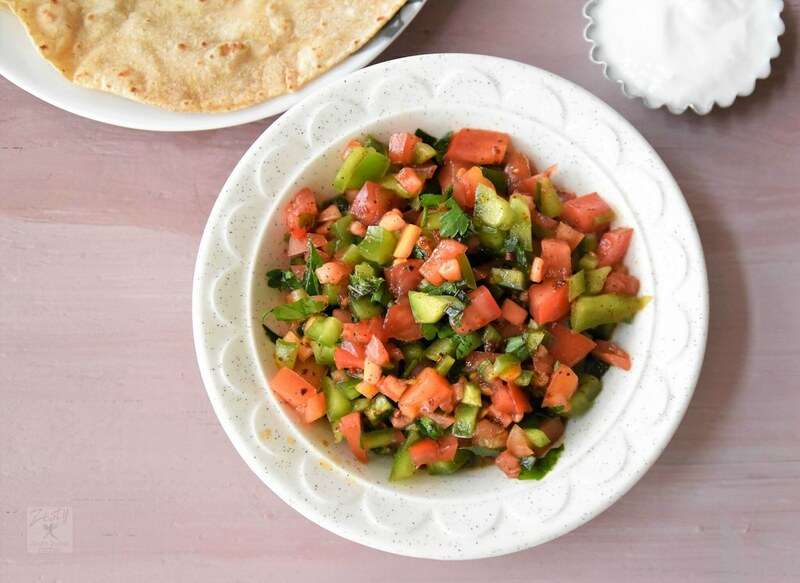 Simple and delicious salad made with tomatoes, bell pepper, herbs and spices. In a bowl add all the chopped veggies, and herbs and then add spices and mix well. 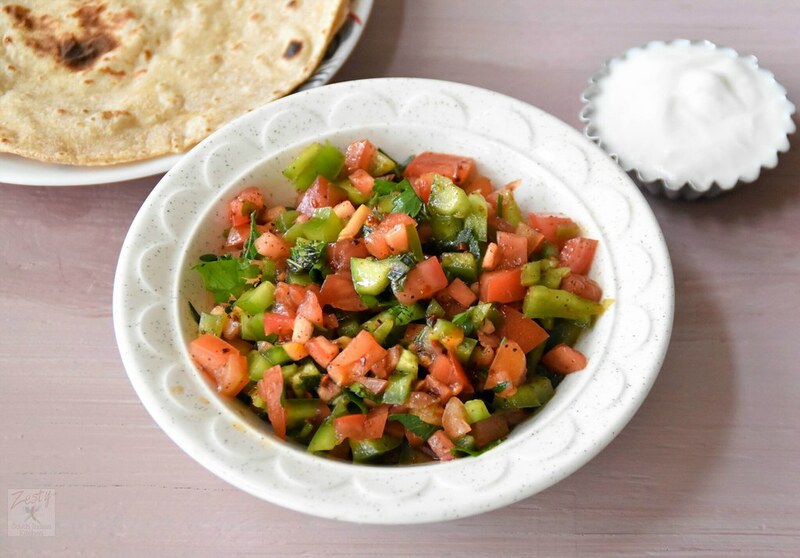 Enjoy with pita bread as salsa or dip. That salad looks delicious. I am in love with spices as well and love to experiment with them. I was just telling my yesterday that we need to some how make few mint plants stay alive during winter. They are so expensive when we buy in winter. Oh this is great! Another use for Sumac. I am the same way with my spices. My husband went into my pantry looking for paprika, he found 4 different types. He thought that was amusing and a bit over the top. Your salad looks amazing and fresh, thanks for sharing this recipe! This looks so fresh and perfect for scooping up with flatbreads. This looks so fresh and flavourful! Mmmm… so sweet, tangy, and lemon-y. I love the use of sumac and pomegranate molasses in this. Pinning this right now!